In this project we are studying how music and autobiographical memories interact. We have approached the problem by first characterizing the content of music-evoked autobiographical memories in college students, and then performing a functional magnetic resonance imaging (fMRI) study with some of these subjects. The image to the right shows results from this study and indicates that the medial prefrontal cortex (MPFC) associates music and memories. This project is motivated by a pair of observations about Alzheimer's disease patients. One is that the MPFC is relatively spared as the disease progresses, and lots of anecdotal evidence indicates that individuals with Alzheimer's disease remain very responsive to music from their past. It seems to give them great pleasure. We would like to develop a neuroscientific rationale for simple cost-effective quality-of-life improvement strategies for these individuals. We are interested in performing in-depth case studies that we call Musical Neurobiographies. Please visit our experiment participation page for more information. Brain regions in green responded more strongly to familiar versus unfamiliar songs. Regions in red responded most strongly to strongly memory-evoking songs. Areas in blue responded more when a song was experienced as pleasing. 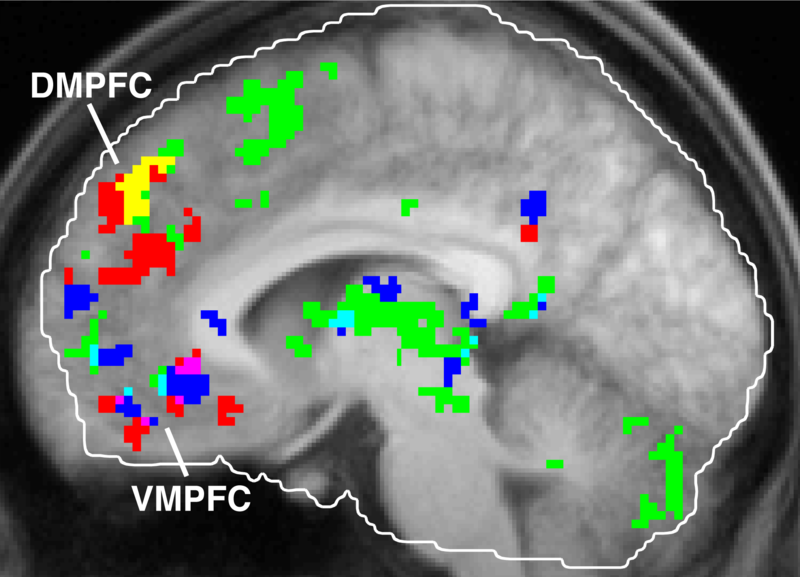 The dorsomedial prefrontal cortex (DMPFC) shows combined effects of familiarity and autobiographical salience (shown in yellow). We have also recently completed a behavioral characterization of music-evoked nostalgia. Our next step is to study the interaction of music, memories, and emotions in older adults so that we can move closer to our goal described above. We received a 2014 GRAMMY Foundation grant to run a small study to validate a semi-structured interview method that compares traditionally cued and music-evoked autobiographical memories in older adult and patient samples. See how some of the musical excerpts we used in these studies move around in tonal space. Janata, P. The neural architecture of music-evoked autobiographical memories. Cerebral Cortex. Advance Access published February 24, 2009, doi:10.1093/cercor/bhp008. For supplementary information, go to the Advance Access page and search for the article. Janata, P. (2012). Effects of Widespread and Frequent Personalized Music Programming on Agitation and Depression in Assisted Living Facility Residents With Alzheimer- Type Dementia. Music and Medicine, 4(1), 8-15. doi:10.1177/1943862111430509. Click here to read the UC Davis press release. February 24, 2009. All other media reports were derived, with varying degrees of accuracy, from the UCD press release or from the derivatives themselves. Nowhere have I ever claimed, nor do I at the present time believe, that listening to music is a cure for Alzheimer's disease. UC Davis Institute of Social Science Interdisciplinary Seed Grant news story about the project titled, "Music-Evoked Remembering in the Age of Big Data." WNYC's Soundcheck and Soundcheck Blog, Toroidal activation patterns of tonal space. Wait. What? , March 2, 2009. AllegroGraph - provided courtesy of Franz, Inc.